This work of art is part of a collection of the “Amon Carter Museum of American Art” located in Fort Worth, Texas. This image represents the city of Laredo, Texas, around 1892. It was painted by Henry Wellge (1850-1917) known as one of the best bird’s-eye-view artists. Born in Germany, he produced around 150 city views in the XIX century. This painting is characteristic of the pictorial map style, showing an area as if viewed from above at an oblique angle. This type of painting centered its attention on the structure and morphology of the cities, also its urban plan and the economic activities during the late XIX century. This painting portrays the exponential expanding process that was suffering the city and how Laredo becomes the gateway to Mexico, all due to the arrival of the railroads in the city (1881). After the Mexican-American war (1846-1848) Laredo was forced to split by the “Treaty of Guadalupe Hidalgo” (1848) in which it was determined that the Great River would act as a natural and political frontier between Mexico and USA. The division let us two different cities, at the North side of the river, Old Laredo, headquarters of the County, Webb, property in USA, and on the South side the Mexicans forced to emigrate found New Laredo, Tamaulipas, property of Mexico. The two different Laredo cities are joined only by two steel bridges that come across the Great River. The town planning is orthogonal plan as in the most of the American colonial cities founded by Spanish. This grid plan used to have a church and a city council in the center although in here we can appreciate some factories too. The grid was also used because it was easier for communication and for defense in case of war. Concerning the streets, we can say that they suffered great changes, introducing new buildings as the new Webb County Courthouse, the city hall and the market house. The city is organized absolutely around the central part of the image. The structure of the old buildings was very simple because the city was plenty of modest one-floor buildings. But the new changes due to the prosperity the city starts to sprawl out in an exponential rhythm, the city starts to shelter several shops or markets to meet public demand that the expansion required at that time. The cathedral at the south central part of the image is another element which gives prosperity to the city meeting the religious demand the city needed. At the left margin we can see the Fort McIntosh, built in 1849, to protect the entire west Texas border. And at the right margin, we can see all the primary sector of the city organized by parcels with the exception of a factory which is a wedge in the environment. It is curious to note that the railroads brought prosperity, newcomers and profits to Laredo, but not without a sacrifice, as a consequence of this fact, the steamboat traffic on the river started to decrease as the city starts to exceed the amount of water they were extracting of the Great River to the irrigation, so the boats used to run aground. We should mention also some facts about the community of the city which was traditionally considered Mexican but with a huge amount of newcomers Anglo-Americans the culture started to break into a separated Anglo society, and the change becomes more latent if it’s possible with the turn of the century. This is a drawing of Cándido Villalobos-Domínguez, a Spanish drawer who immigrated to Argentina in 1905. He was a drawing teacher at Buenos Aires University and also the artistic director of Caras y Caretas, a popular weekly magazine of the time. This picture of Buenos Aires, capital and largest city of Argentina, was retrieved from www.skyscrapercity.com, page 268. In 1913, he was asked to draw a picture of how Buenos Aires would look like after some planned reforms. The drawing represents the CBD, which is called LA CITY PORTEÑA. It is the core part of the city where the main economical activities take place. In this area we can also find most of the public buildings, such as the Congress, Ministries, Courts of Justice, Central Bank and the Government House, called Casa Rosada. It doesn’t appear in the drawing because it is located on the unseen side of the Plaza de Mayo. Juan Díaz de Solís, sailor and explorer that served the Spanish Crown, discovered the Río de la Plata in 1546 and twenty years later Pedro de Mendoza founded the first city of Nuestra Señora del Buen Ayre on the western shore of the estuary of this river. 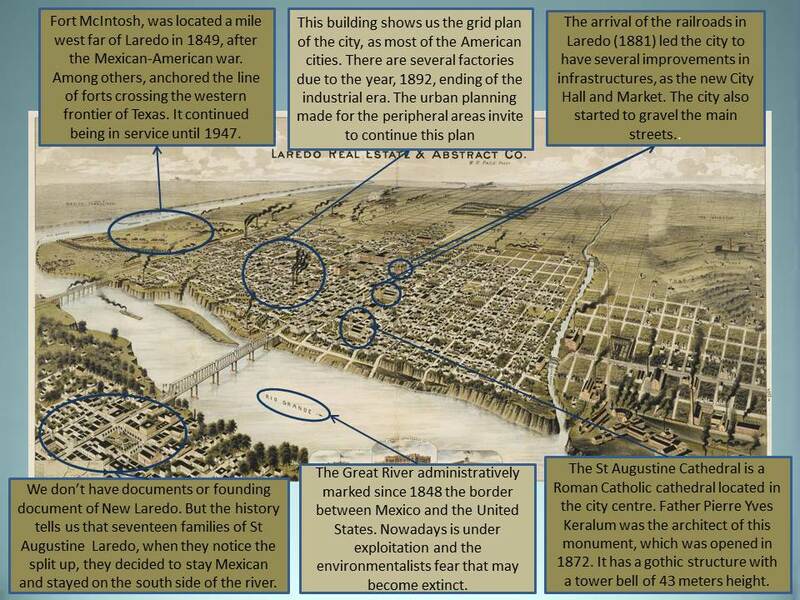 In 1580, when Juan de Garay refounded the city with the name Santísima Trinidad, he planned and designed it as a grid. The street layout is perpendicular and the standard size of the city block is 100 m x 100m. As in most Spanish colonies in America, they built around the main square (then called Plaza de Mayo) the Cabildo, the Cathedral and the seat of government, originally a fort which was later replaced by the Casa Rosada. At the end of the 19th century, population had increased considerably with the arrival of immigrants, mostly Europeans, attracted by the great economic growth due to the income generated by the export of raw materials. By the beginning of the 20th century Argentina had become one of the richest countries in the world. In 1869, according to the first national census, population was 187.126 inhabitants and in 1914 there were 1.575.814 inhabitants. As a result of this population growth, it was decided to start a series of public works in order to build new public buildings, provide the city with more open places and improve traffic circulation. Reforms should respect an aesthetic sense and some of them were inspired by cities as Paris. In 1885, public works began on May Avenue and were completed in 1894. The avenue’s layout was built through existing urban blocks that were expropiated. It was necessary to demolish part of the north arcade of the Cabildo to make way for the avenue’s entry into Plaza de Mayo. The avenue connects the seat of the executive power, the Pink House, with the Congress. Along its 1,5 km way, we can find sophisticated buildings of art nouveau, neoclassic and eclectic styles. Two diagonals were pojected from the Plaza de Mayo, one starting at the north- west corner of the square (North Diagonal) and the other at the south-west corner (South Diagonal). The North Diagonal has an extensión of 1 km and links the Plaza de Mayo with the Courts of Justice. One of the most prominent features of the North Diagonal is the constant line of cornices of 67,5 meters high, which gives an overview of continuity along its route. It is curious to note that some features that appear in the drawing were modified from the original project and some works weren’t carried out. For example, to create room for the South Diagonal, in 1931 the three southernmost arcs were demolished. In the drawing of 1913, the South Diagonal is scheduled without this demolition, that is why the Cabildo kept its five south archs. 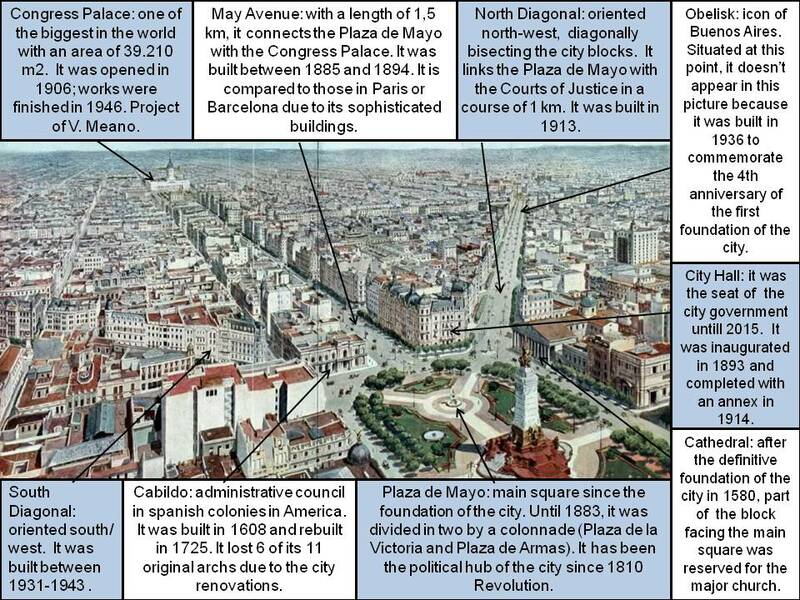 Villalobos also included in his drawing a big monument in the middle of the Plaza de Mayo that it wasn’t built. At present day we can find a small pyramid in the centre of the square that was erected in 1811 to commemorate the first anniversary of the Revolution, first step towards Independence. Works above mentioned modernized the city and reflects a time of great economic power of the Argentina Republic. They gave Buenos Aires a rich, cultural and achitectural heritage, making it “the capital of an empire that never existed” (André Malraux). This picture was painted by Jano Muñoz in 2010, and its title is “Cielo encima de Oporto”. It was displayed in Moret Art Gallery in 2010, in an exhibition of Contemporary Art in A Coruña, Spain. 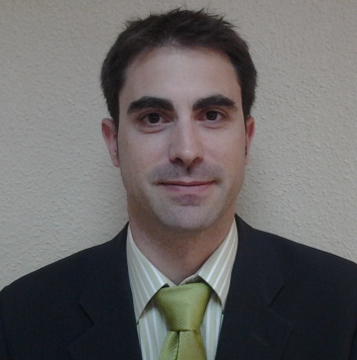 Jano Muñoz was born in 1971 in Galicia. 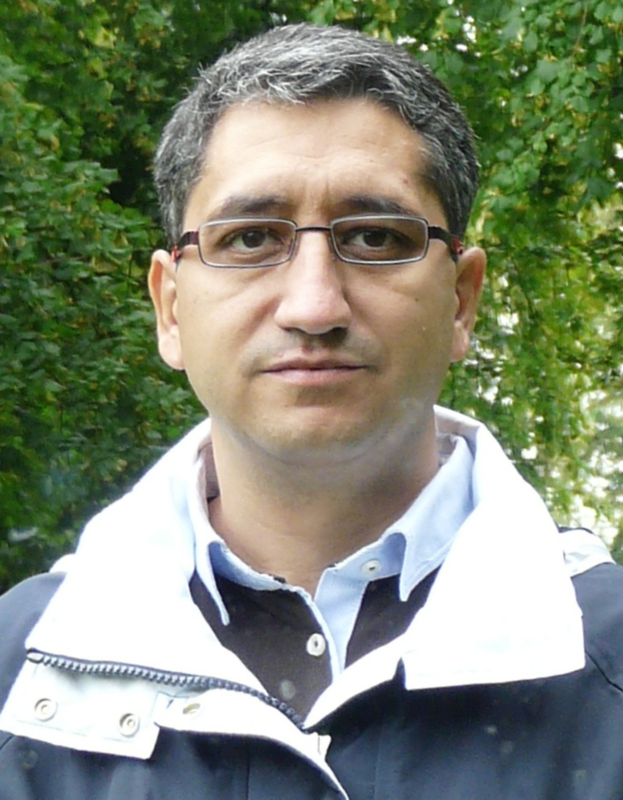 He is a contemporary but classical painter who is used to painting landscapes. This type of painting centers its attention on the commercial life of the Porto harbour and the façade of the buildings in the 20th Century. The city of Porto is situated in the North of Portugal and is the second most important in the country. We should mention that Oporto means “port”, because the Duero river had a lot of importance in city since ancient times. 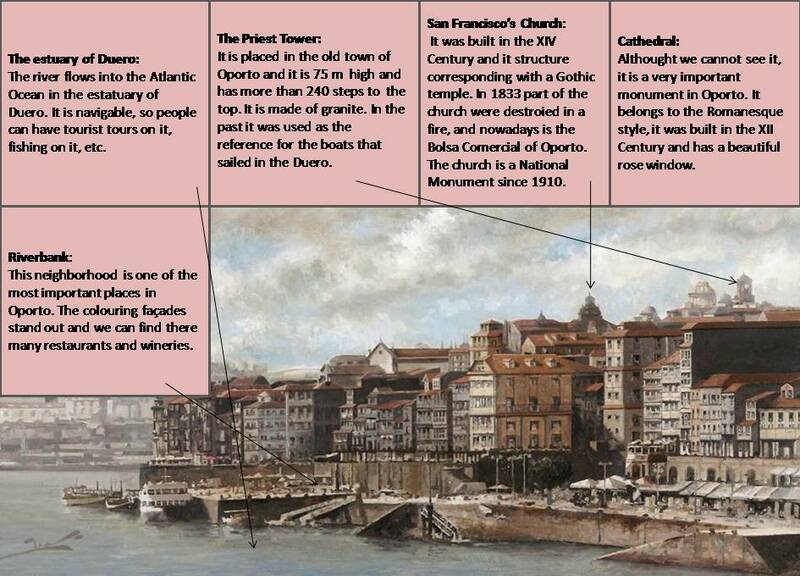 This image represents the Duero river, the harbour of Porto and some traditional examples of the architecture of the city. The painting is divided into two parts; on the one hand we can se a very cloudy sky, although it is still beautiful, on the other hand, it is represented the commercial life and restaurants of the touristic zone of the riverside. Also, we can see boats and ships which could represents the activity of fishing and trade. We can infere the urban layout of Porto as irregular except the riverside promenade that forms a line of traditional buildings parallel to the river. Generally speaking, the streets and buildings outline is inappropiate and suffers a huge deterioration, so it can be a problem for the people who currently live there. In the foreground, we can see the Main Street in the right margin of the picture, which is a kind of market place and leisure area, next to the harbour. At the top of this part, there is a small castle and other ancient buildings. Regarding the buildings, we should mention their façades; we can highlight them and their subdued colours, such as blue, white or yellow. The appearance of the city is cramped because all the buildings are close to the others wihout much space between them. It is curious to note that the old quarter was named a World Heritage Site in 1996 due to the importance os some monuments, such as the Stock Market Palace (World Heritage Site), the Cathedral (built in the XVII Century) and the Tower of the Priests. As a curiosity, Porto has the longest underground in Portugal. Interestingly, we can point out the importance of the vineyards and the wine of Porto, that are a very popular attraction for tourists and also a significant good for economic activities. To conclude, it is also important to mention that Porto is known too as the city of bridges. 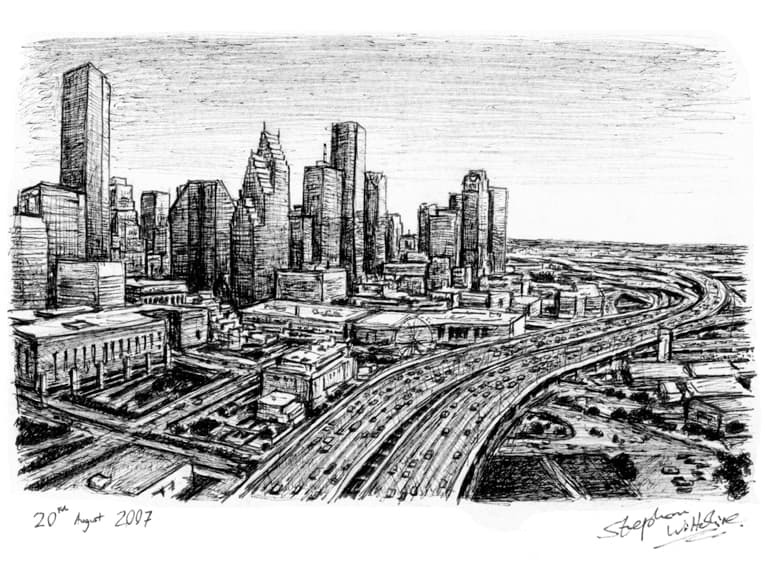 This image was painted in 2007 by Stephen Wiltshire, who has a lot of paintings in pen and ink. He has a very special way of painting and a particular talent for drawing lifelike. The painter was diagnosed with autism when he was a child and he painted the cityscapes he observed briefly before. He only used his mind and used his drawings to communicate with the world. This style is really accurate, known over the world and held in a huge number of collections. This work of art belongs to the city’s collection of the author who also paints buses and animals and it is painted by pencil. We can see the signature of the autistic painter in the bottom right where his name is written completely. It is a painting of commercial and economical perspective and shows us the main way to travel along Houston. Stephen Wiltshire has a shop with his name in London, where he was born and where you can see and buy some of his paintings. Also, he has done a lot of exhibitons around the world, where you can see drawings of a great number of cities. The image portrays in a clearly way a place in Texas. Texas represents 7 % of the territory of USA and occupies the southern part of the center of the country. It shares border with Mexico; in the southern part, its neighboring states are Oklahoma, Louisiana, Arkansas and New Mexico. In particular, this picture focused its attention on one of the most popular areas of Texas, Houston, which is the most important city in relation to the technological, commercial and business factor. It centered its attention on the suburbs because we can see the city limit and also the business district, where there are some industries. Concretely, it is Downtown Houston, which means that it is the Central Business District, and the image portrays with a great amount of details, not only the buildings but also the amount of cars and the activity during a normal day. The main way is full of cars in both directions, so there may leave a lot of people that move to work and in the other way around. We can realize that there are many traffic lanes in both directions, so we can guess that it is a really busy place. The town planning seems to be regular, as we can observe some square in the left margin. Its streets are distributed following a grid plan, typical of developed urban plans in major US and European cities from the late nineteenth century and most of the buildings are connected by subways. Also, we can find two main spaces separated by the road. In the right margin, we can appreciate the nature and undeveloped area (non-urbanized). On the left one, we have a lot of buildings: starting mainly for industrial buildings and in the far zone skyscrapers. 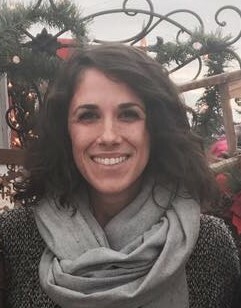 I can imagine that skyscrapers aren’t only for a living, I think they thought to work on, because the point in which they were built (as commercial centers) was the moment when the economy improved a lot. It is really a tourist city that have a lot of famous museums and parks, so it is visited for too many people like New York. Concerning the structure, we are not in the old quarter or in the city center because we can´t distinguish any church or city hall, are we can neither distinguish shops or parks. So, as I have said, we can clearly appreciate the central business district (CBD) in the left part of the image that marks the limit between the city center and the outskirts and is the home to the financial district. This part of Houston is also home to the entertainment, for example to sports: baseball. 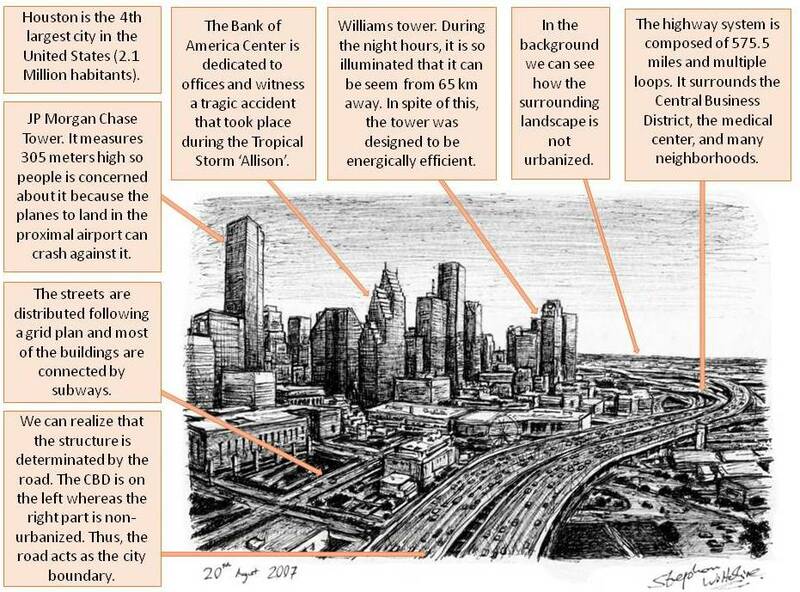 It is curious to note that the painter has drawn the most important buildings in the city like: Bank of America center, Wells Fargo Plaza, Williams Tower, One Sell Plaza and First City Tower. Also, I can point out that Houston was the capital of Texas until 1840 and based its economy on the agriculture, but when petroleum was discovered at Spindletop Houston changed his economy. Another important fact is that in 1960, La NASA called Houston as The Control Centre manned spacecraft, and “Houston” was the first word spoken from the moon. It has also many important industries, medical centers and a famous baseball field. This work of art was painted by José García. It is a watercolor that represents Platerias Street in Valladolid. With this image, the painter started a collection of paintings inspired by a street race entitled “Ríos de luz”. During this race some emblematic buildings of Valladolid were illuminated at night, and that encouraged the painter to exploit the characteristic colors produced overnight. It also shows one of the most important churches in the city center. 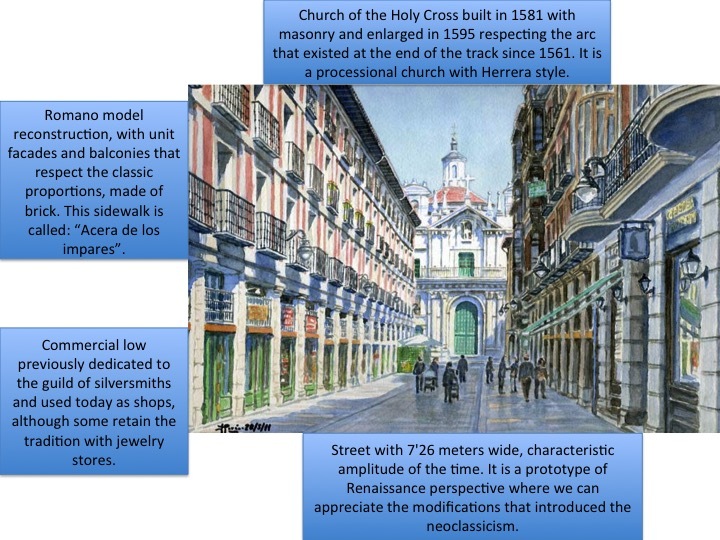 In the foreground we can see Platerias Street that presents a prototype of Renaissance perspective of the late sixteenth century and a development model for that time. For many years it was the main street of Valladolid. Silversmiths established here for a long period of time and they had the privilege of closing the street at night with chains. This street suffered frequent floods from the north branch of the river Esgueva, which is very near. In addition, there were a number of fires that made necessary some reforms during the 17th and the 20th centuries. In the 17th century it took place the major renovation project after a fire that significantly affected the commercial center. To do this, the royal architect of Phillip II conducted a reconstruction of the houses following a Roman style with regular seats by arcades, balconies, facades and unit alignment of streets. These new buildings should respect the classic proportions, based on the brick or the Castilian foot, modulates floors and elevation of buildings, squares and streets. The materials used follow the trend set by the Habsburgs: brick facades clad in red and gray for the columns, footings and lintels from Cardeñosa (Ávila), along with wrought iron on the balconies and joinery painted in Green. Nowadays you can distinguish two parts in all the buildings, the first floor for housing and the ground floor for commercial spaces known as the antique silverware. The urban organization of this street is divided into three parts: commercial spaces, cultural buildings and houses. If we see the street from an aerial perspective we could see an irregular flat in the center of the town where the Street of this painting is situated. On the other hand, we can appreciate the profound renovation that has suffered the buildings and how it has developed from a street only for the silversmiths guild to includes new business. As a remarkable fact, the colors that the painter used are bright colors that lead us to think that it is a modern street even though the layout that it have. Also, we can suppose that it is a busy street in the area because of its location and therefore through these very light colors it invites you to visit Platerias Street. It is a good example of building renovation as it kept the essence of the buildings in the past and because of that I choose this painting. The church standing out on the background is one of the most important churches in Valladolid: the Penitencia de la Vera Cruz church. It was built in 1581 by Pedro de Mazuecos, an architect who draws it with a nave and a dome respecting the arc that was down the street since the fire of 1561. This church had a meeting room and warehouse for procesional activities. The building was modified by Diego de Praves in 1595 forming two bodies that simulate triumphal arches, separated by the balcony for the authorities typical physiognomy of the penitential churches of the time. In 1667 it was extended with vaulted naves and flat head. This picture shows a beautiful sunset from a helicopter’s view in the city of Las Vegas. It is an available limited edition, which belongs to Thomas Kinkade called “Painter of light” because he started to incorporate multiple sources of light in his paintings. 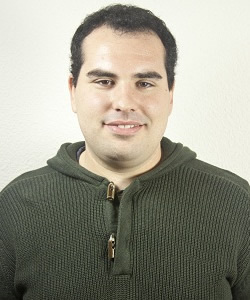 This image is posted on the official website of the author. It portrays Las Vegas Strip in 2009, the most famous avenue in the USA. The author of this piece is known because he used to paint a pastel or oil in order to saturate the colours and create bright glare as shown in the image. What makes this picture awesome is the style of the work because of its colour tones and its brightness; that was the reason why I chose this picture. 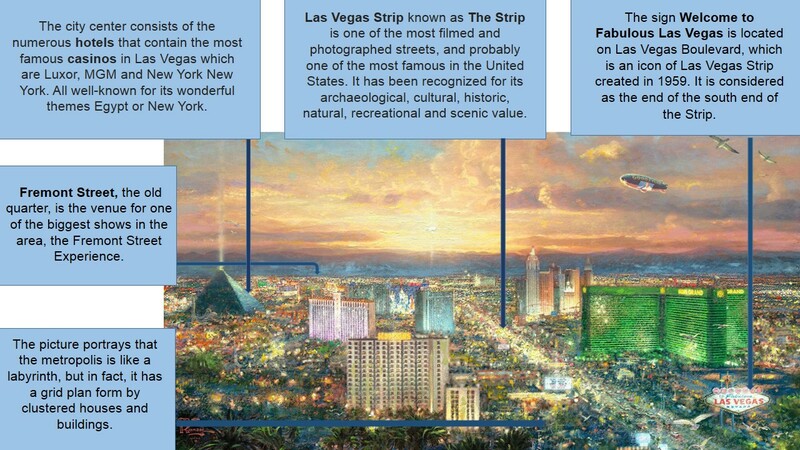 Kinkade prints a particular character that evokes the American Enlightenment showing Las Vegas. The painter displayed inspirational messages through a very American theme, that is fullo of symbolism. For example, he uses birds on this painting to represent peace and freedom; the light represents God’s influence; and the movement symbolizes continuous change in life. Kinkade uses the light sign of “Welcome to fabulous Las Vegas” to remind us to share the light, guide others and love them. In addition, it was built by Western Neon and used the distinctive design of Populuxe architecture, very popular at that time. Last but not least, he embodies the lives that have passed using clouds. For this reason, its lack of human content and his excessive patriotism was often criticized. Due to the large presence of casinos this city is known as the entertainment capital or Sin City because of the peculiarity of gambling and betting and also because of its excellent and fascinating shows. It is said that this is one of the most visited cities of the United States of America not only because of its natural recreational but also its archaeological, cultural, historic and scenic value. Las Vegas comprises a thousand and one wonders that allow tourists a range of possibilities as we can see in the picture. The social activity in the city is based mainly on the tertiary sector. On the other hand, most businessmen had taken advantage of tourism in order to create institutions like museums or attractions. What is more, there are shopping centres, sights and shows. Also, they use spectacular sceneries where you could visit different countries without leaving the city. But the most famous activity is to sell weddings in the presence of actors who imitate famous people like Elvis. Culture has a place in town, walking, but intense with The Neon Museum, among others, as well as music, because in this city we can find numerous festivals devoted to jazz or rock for example. The image shows the large number of lights make Las Vegas one of the cities with the highest light pollution in the United States; nevertheless the light is their main weapon to attract tourists. The CBD of this city is in the busy centre of the city that corresponds to the street that we see in the picture (the main street) which is the commercial area of it. Therefore, we can find in the city centre large buildings that hide casinos and hotels of all kinds and in the outskirts, a mass of houses that extends across the desert. The city has a regular urban layout, a grid plan that consists of groups of clustered nucleated houses spread on residential areas with the CBD crossing the city. The old quarter corresponds to Freemont Street, which was the highest representative of Las Vegas until the creation of large buildings on the Strip. It is a city whose story has been told thousands of times in films like The Hangover, Casino, Ocean’s eleven, etc. Furthermore, its wonderful landscape has been the scene of numerous series as Vegas. This wonderful city is also known for its famous What Happens Here, Stays Here (R&R Partners, 2003). “Las Vegas is an island of light in the middle of nowhere… A black sea with an incredible source of light emanating from the city and its infamous Strip… You can almost see the electricity running through it” (Vincent Laforet, 2002). Analyzing this paradise we can find that Las Vegas has an effect island to be located in the middle of a desert in Nevada, is an arid area surrounded by mountains. Furthermore, it has a desert climate with very little rain and extremely hot in the summer so people use tunnels and corridors to move from one casino to another. This painting belongs to Manarola, which is the oldest of the cities of the Cinque Terre. The Cinque Terre is a zone that is located on the rugged coast of the Riviera Italian. “The Five Lands” comprises five villages: Monterosso al Mare, Vernazza, Corniglia, Manarola, and Riomaggiore. 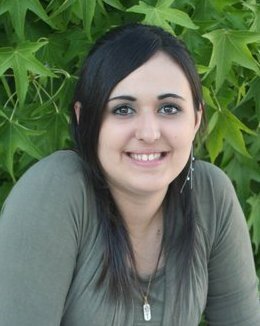 The painter is Dominic Piperata, a very famous artist from California. The image comes from the artist’s official blog and is characterized by its brilliant color and simplicity. It centers its attention in the cliff and the terraces formed in the rock. The author also wanted to reflect the simplicity of the houses. 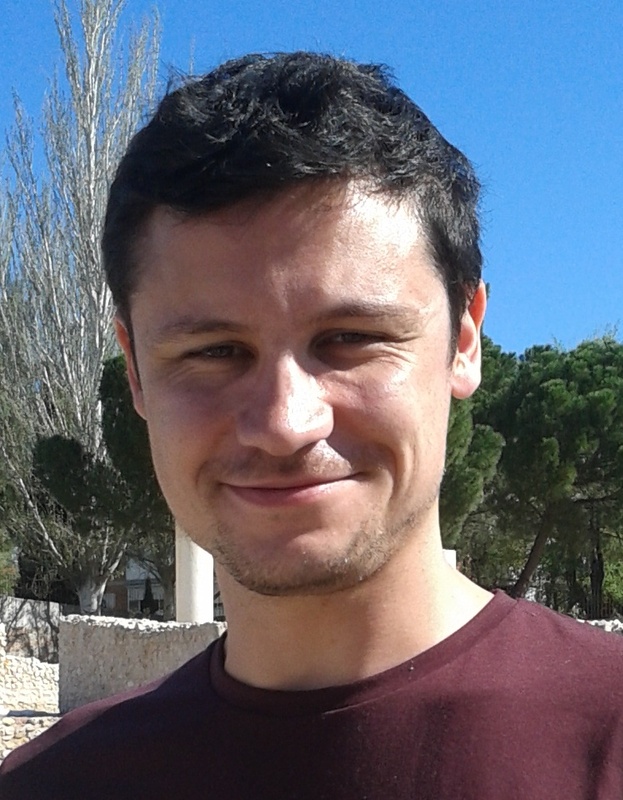 With a soft style he shows to the perfection that it is a calm village. In this image we can appreciate the great importance that has the cliff and the port for the development of fishing. In the last years, these 5 villages have become very popular and its tourism has increased, overall in summer. 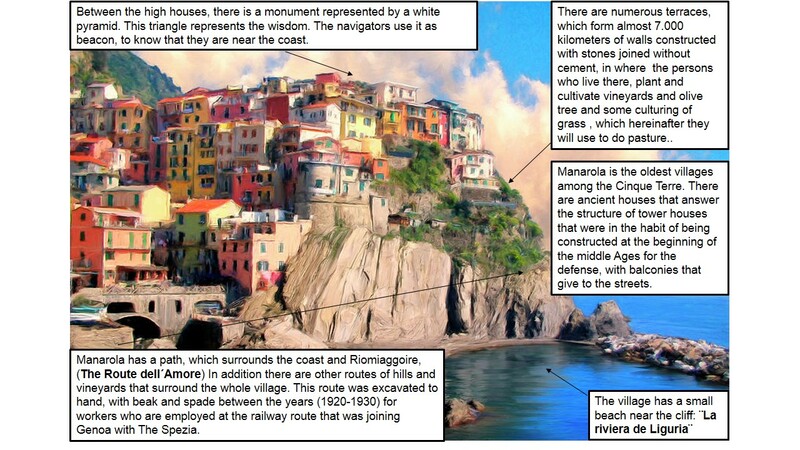 However, the most important activity in Manarola is concerned to the primary sector (fishing and viticulture). Manarola has a path, which surrounds the coast and joins with Riomiaggoire, (The Route dell´Amore). In addition it also has routes of hills and vineyards that surround the whole village. This route was excavated to hand, with beak and spade between the years (1920-1930) for workers who are employed in the railway to join Genoa with The Spezia. The Five Villages are connected between them thanks to these ways but many people are still using boats. The cars cannot come in the village because of the narrowness of the streets. The town planning is irregular, because the village is set in the edge of a cliff and it cannot construct this one of another form. In the center of the village there is a temple dedicated to ¨The Manes¨ – Roman patron gods of the house, representing the spirits of the late relatives. Concerning the streets, Manarola has a main street which is Via di Mezzo, which in turn follows the course of the water. Also we can find 3 principal streets: ¨Via Antonio Discovolo¨, ¨Via Di Corniglia¨ and ¨Via Renato Birolli¨. The village is formed by small houses that are wonderfully painted. The houses are distributed along the principal streets. There are numerous terraces, which form almost 7.000 kilometers of walls constructed with stones joined without cement, in where the persons who live there, plant and cultivate vineyards and olive tree. This village does not possess any monument of great importance, since is characterized by its spectacular view and its beautiful beach, where it is possible to practice scuba diving. The streets are narrow, the majority with stairs. There are ancient houses that answer the structure of tower houses that were in the habit of being constructed at the beginning of the middle Ages for the defense, with balconies that give to the streets. There are a lot of boats along the streets. Manarola is the oldest of the villages in the Cinque Terre, with the cornerstone of the church, San Lorenzo, dating from 1338. At present, the place is catalogued as World heritage of the Humanity, and from 1998 has happened to turn into National Park and Preserved Marina Zone. It is curious to note that the ships have to get up to pulse up to the nearest terrace, because the wharf does not exist. The fishermen use ropes and talk a local dialect called Manarolese, which is marginally different from the dialects in the nearby area. An historical event that took place here is that until the 60s this zone was isolated by its detachments. In conclusion, this zone of the Cinque Terre is characterized for being a place of easing.